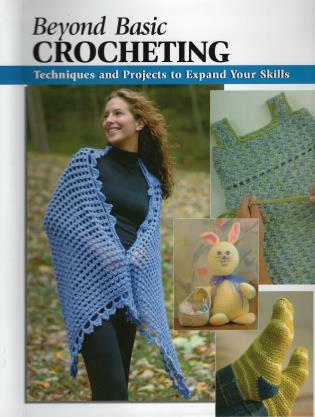 Here is the perfect book for crocheters who know the basics and are ready for more. The follow-up to Basic Crocheting takes crafters to the next level--every step is carefully explained and supplemented by helpful visuals to eliminate any confusion. Beautiful projects offer a wide variety of items to wear, use at home, or give as gifts. This heavily illustrated guide will help crocheters master the techniques of felting, Tunisian crochet, joining motifs as they are made, working with wire, and beading, and will teach some exciting new stitches as well. Sharon Hernes Silverman is a writer and crochet designer in West Chester, Pennsylvania. She is also the author of Tunisian Crochet (978-0-8117-0484-7), Crochet Scarves (978-0-8117-0081-8), Crochet Pillows (978-0-8117-0646-9), and Tunisian Crochet for Baby (978-0-8117-1287-3). Knitwear and crochet designer Annie Modesittâ€™s designs regularly appear in magazines such as Interweave Knits, Vogue Knitting, Knitterâ€™s Magazine, and Cast On. She also sells her patterns through Ravelry and her website anniemodesitt.com. Annie teaches knitting and crochet classes around the country, and also offers online classes at knittingheretic.com. She is the co-owner of ModeKnit Yarn, a line of hand-dyed yarns and yarn kits (modeknityarn.com). She is the author of numerous books and was a contributor to Beyond Basic Crocheting (978-0-8117-3392-2). She lives in St. Paul, Minnesota. Follow her on Twitter (@modeknit) or on Facebook (Annie-Modesitt-Knitting-Heretic). Kristin Omdahl is a Michigan-based knit and crochet designer and a regular contributor to fiber arts books and magazines. Alan Wycheck is a concrete specialist and former partner in The SO Factory, a concrete design company. He is also an award-winning photographer and lives in central Pennsylvania.